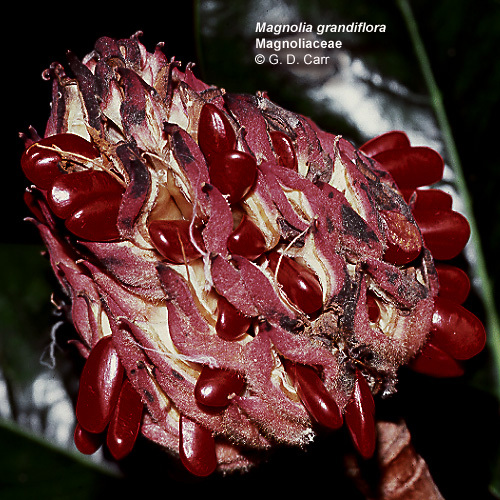 The Magnoliaceae are woody trees and shrubs comprising 12 genera and about 220 species. 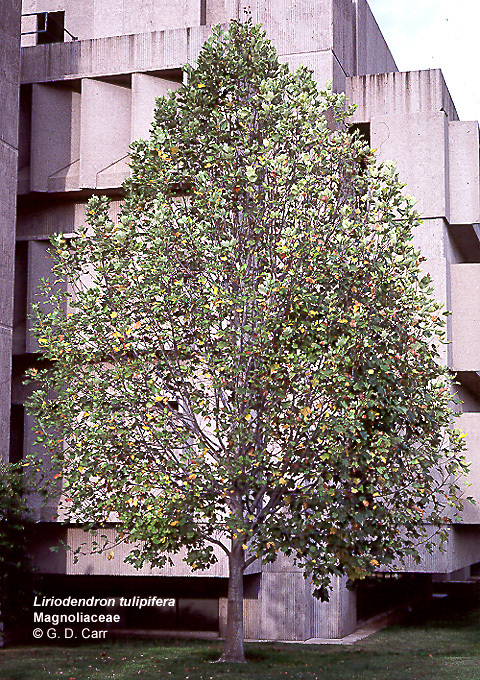 The leaves are simple, and alternate, usually with deciduous stipules that enclose the bud. 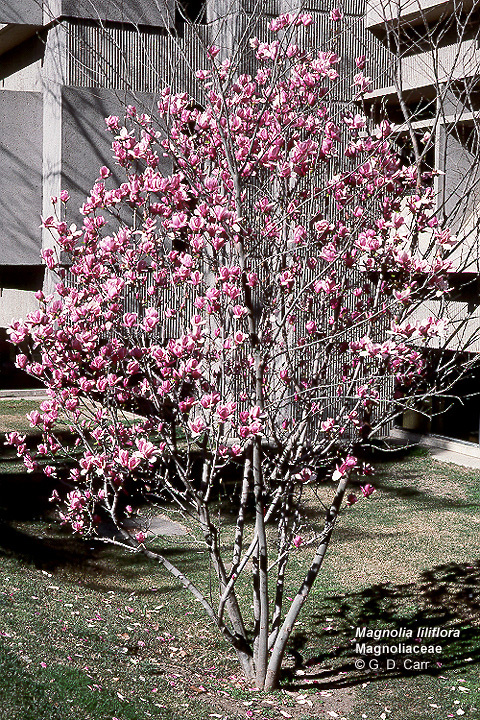 The flowers are bisexual, actinomorphic, and usually large, generally with 3 sepals and 6 to many petals. 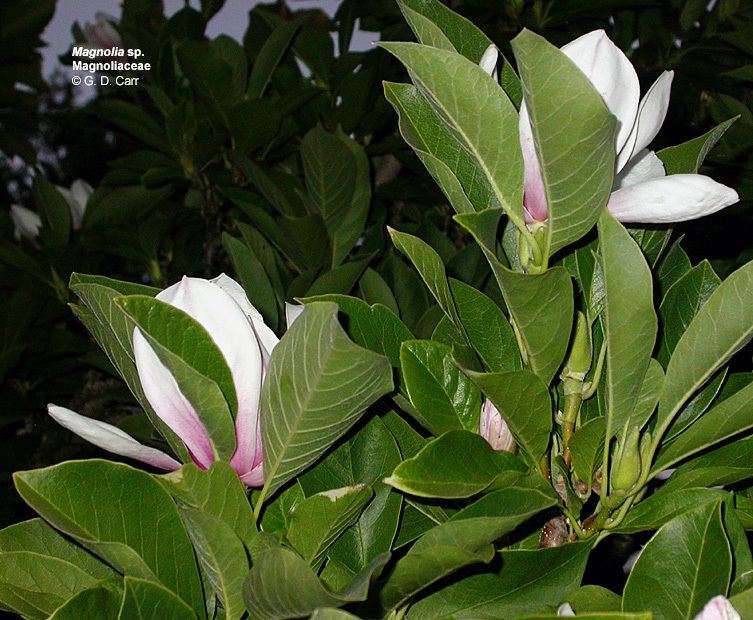 The androecium consists of many helically disposed stamens, each with generally large microsporangia and usually a short, poorly differentiated filament. 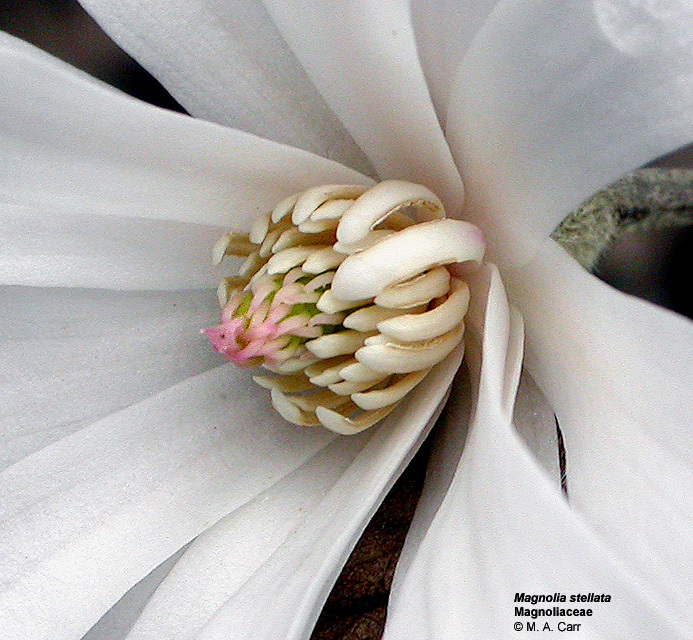 The gynoecium is apocarpous, consisting of many helically disposed simple pistils. 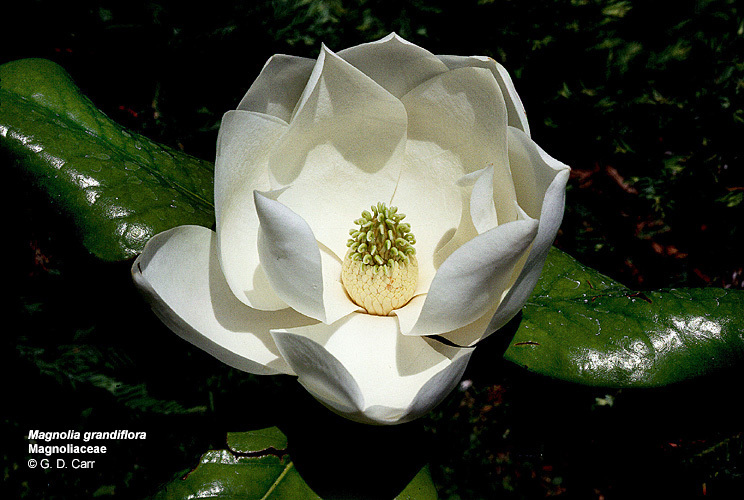 Each pistil has a superior ovary with a single locule and one to several marginal ovules. 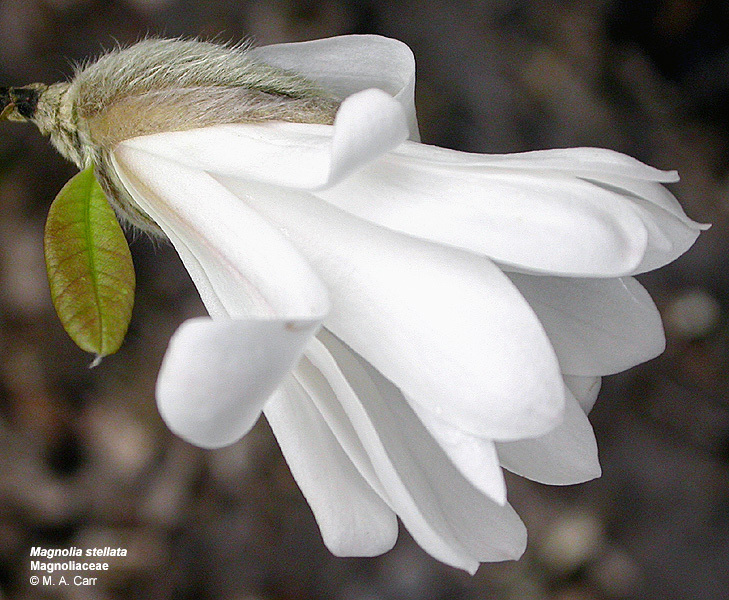 All of the floral parts are distinct and are attached to an elongated receptacle. 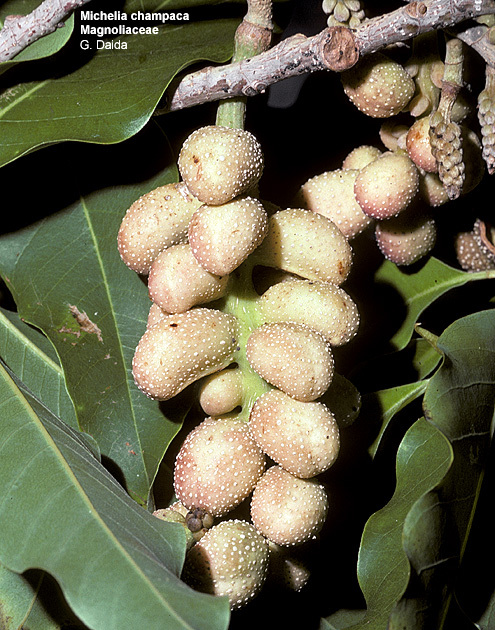 The pistils mature into follicles or less often berries or samaras. 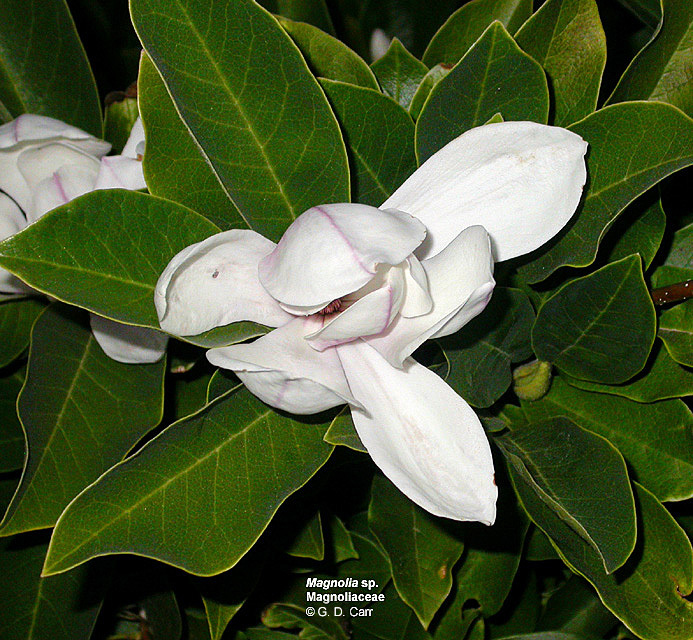 Magnolia grandiflora. 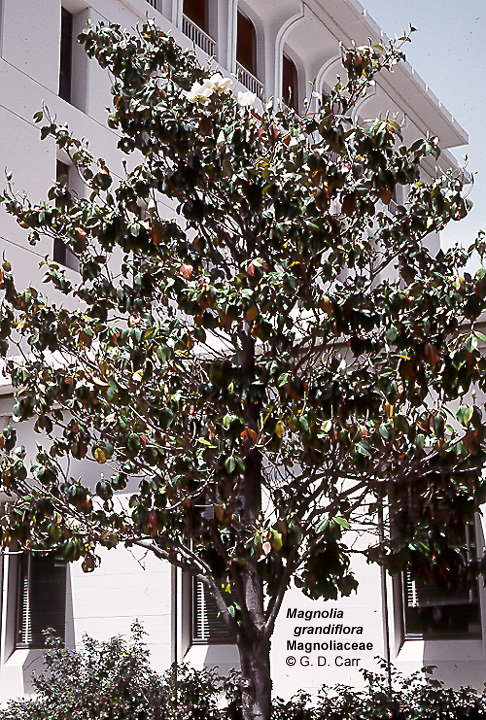 Note the large, bowl-shaped flower consisting of undifferentiated perianth segments. 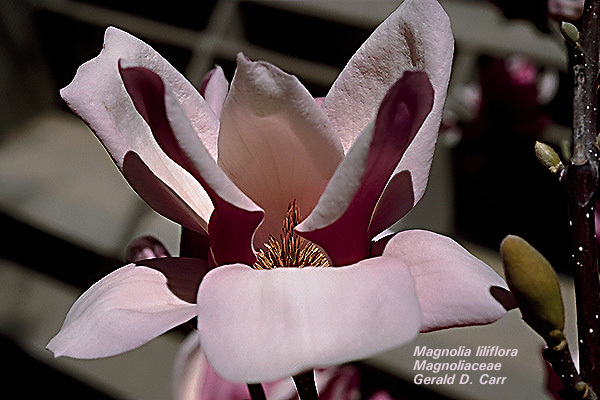 The elongated receptacle also bears many separate stamens and pistils. 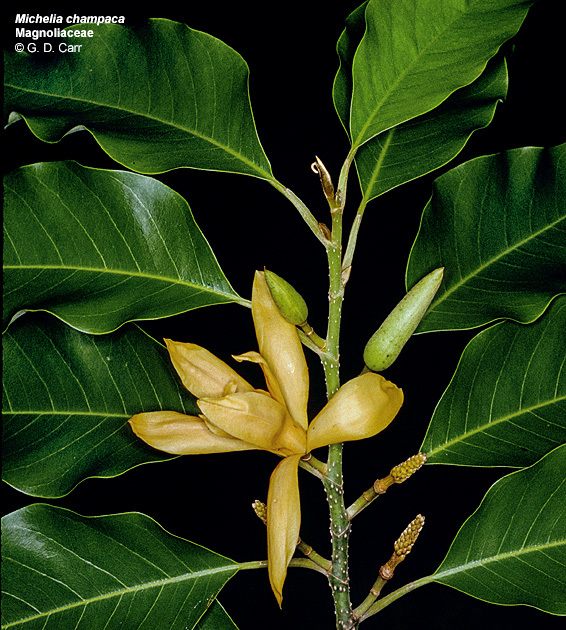 In the lower photo the perianth segments and most of the stamens have abscised from the floral axis. 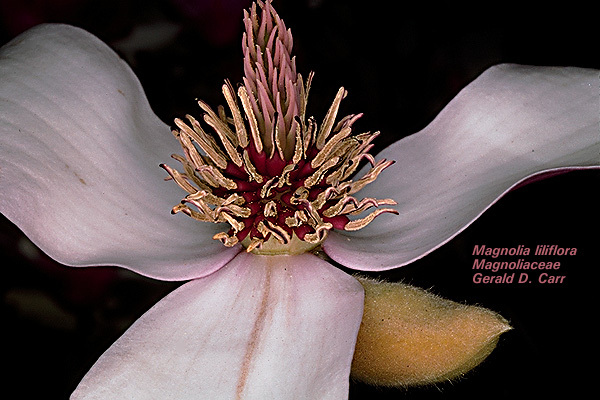 The pistils remain and are developing into follicles. 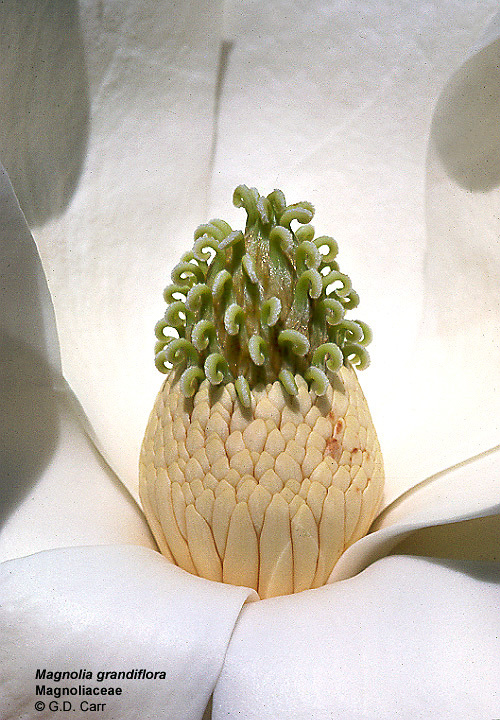 Magnolia liliflora. 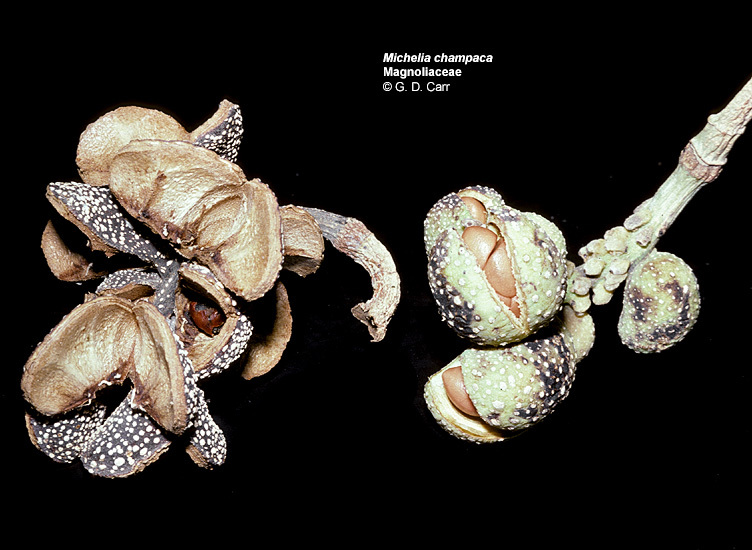 In the 4th photo some of the perianth segments have been removed to reveal the androecium and gynoecium. 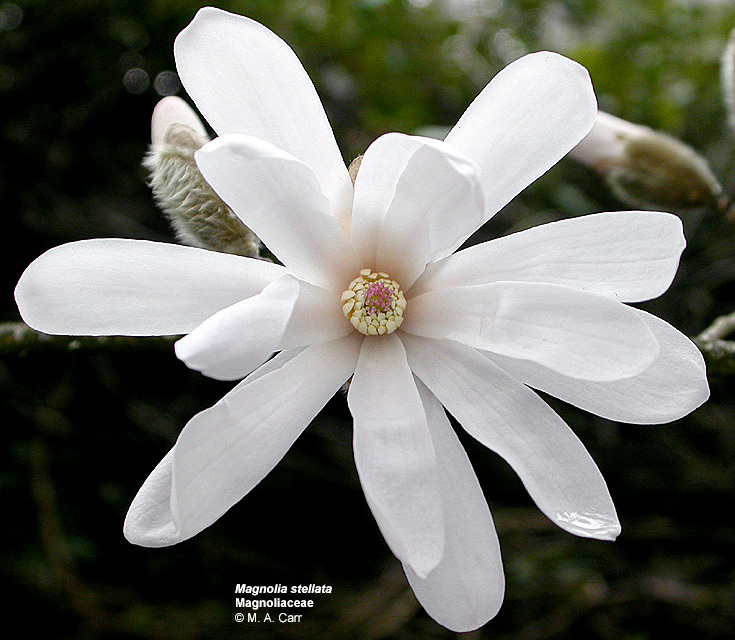 Magnolia stellata, Corvallis, OR, 2003. 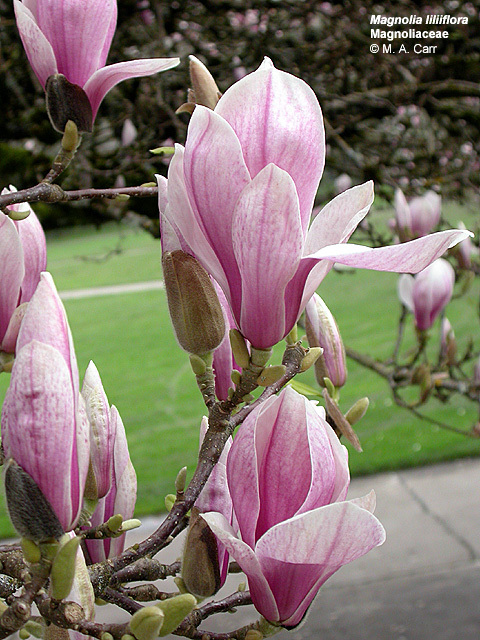 Magnolia sp., Corvallis, OR, 2003. 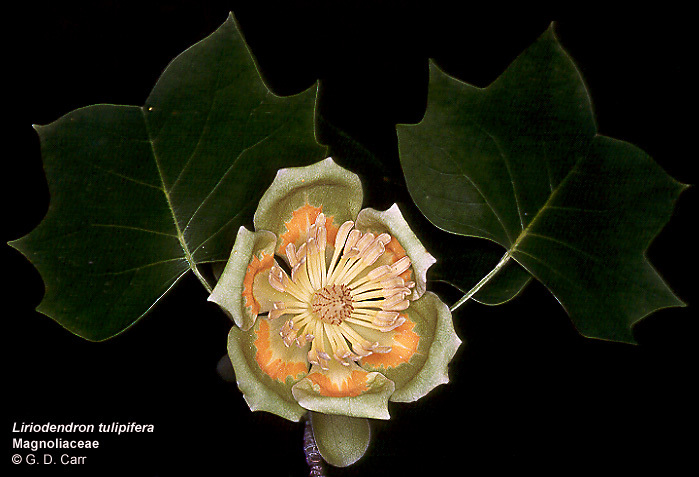 Liriodendron tulipifera, tulip tree. 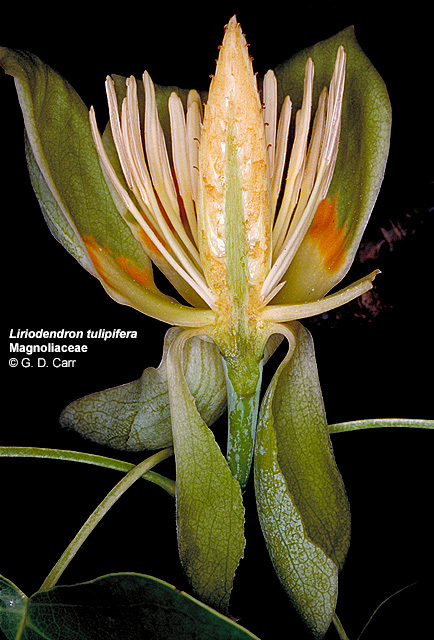 This longitudinal section of the flower shows the greatly elongated floral axis, distally bearing many closely appressed, yet distinct pistils. In this case the pistils will develop into samaras. 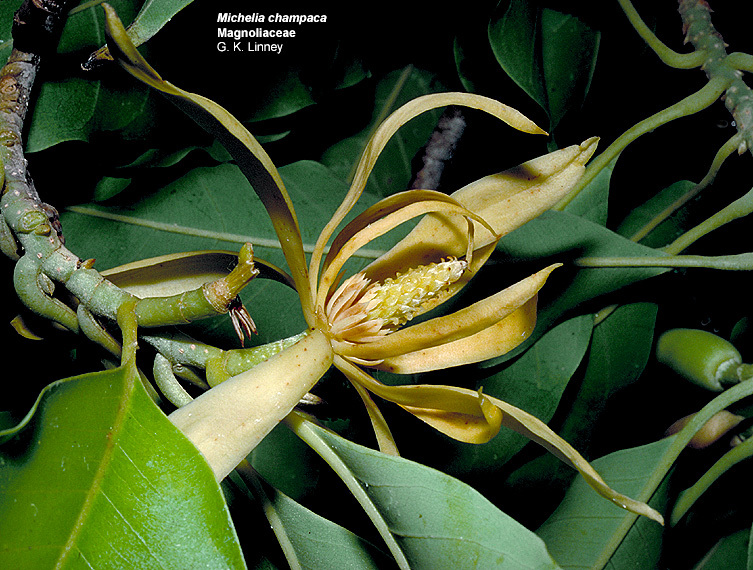 Michelia champaca, orange champak. 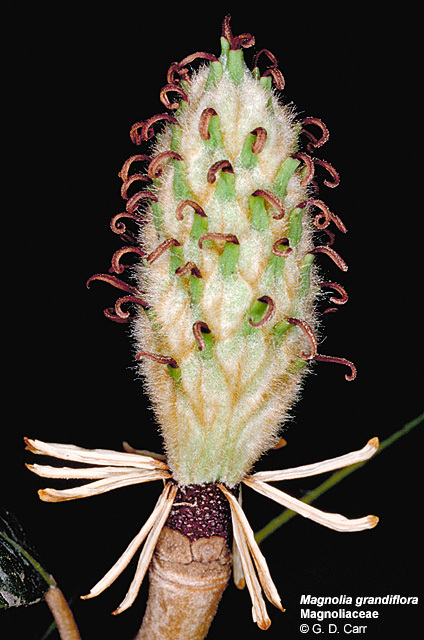 Note the elongated receptacle with many separate stamens and pistils and the development of each pistil into a follicle. 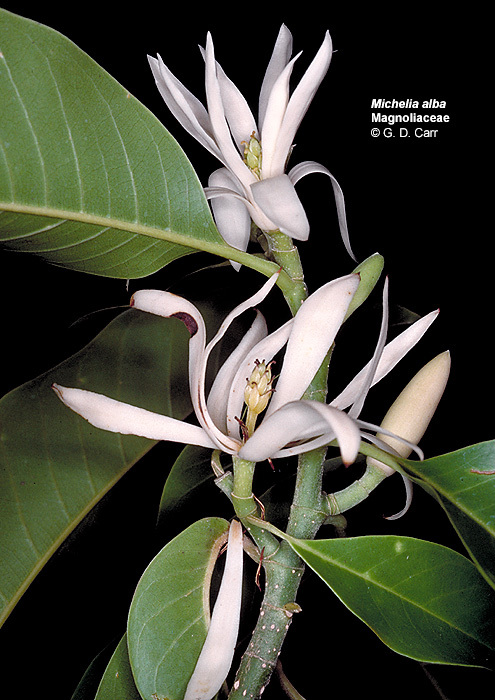 This species has strongly scented flowers that are used for perfume.